1 The new beginning now becomes the focus of the curriculum. The goal is clear, but now you need specific methods for attaining it. The speed by which it can be reached depends on this one thing alone—your willingness to practice every step. Each one will help a little every time it is attempted. And together will these steps lead you from dreams of judgment to forgiving dreams and out of pain and fear. They are not new to you, but they are more ideas than rules of thought to you as yet. So now we need to practice them awhile, until they are the rules by which you live. We seek to make them habits now, so you will have them ready for whatever need. 2 Decisions are continuous. You do not always know when you are making them. But with a little practice with the ones you recognize, a set begins to form which sees you through the rest. It is not wise to let yourself become preoccupied with every step you take. The proper set, adopted consciously each time you wake, will put you well ahead. And if you find resistance strong and dedication weak, you are not ready. Do not fight yourself . But think about the kind of day you want and tell yourself there is a way in which this very day can happen just like that. Then try again to have the day you want. 4 Today I will make no decision by myself. 5 This means that you are choosing not to be the judge of what to do. But it must also mean you will not judge the situations where you will be called upon to make response. For if you judge them, you have set the rules for how you should react to them. And then another answer cannot but produce confusion and uncertainty and fear. 6 This is your major problem now. You still make up your mind and then decide to ask what you should do. And what you hear may not resolve the problem as you saw it first. This leads to fear because it contradicts what you perceive, and so you feel attacked. And therefore angry. There are rules by which this will not happen. But it does occur at first, while you are learning how to hear. 8 If I make no decision by myself, This is the day that will be given me. 9 These two procedures, practiced well, will serve to let you be directed without fear, for opposition will not first arise and then become a problem in itself. 10 But there will still be times when you have judged already. Now the answer will provoke attack unless you quickly straighten out your mind to want an answer that will work. Be certain this has happened if you feel yourself unwilling to sit by and ask to have the answer given you. This means you have decided by yourself and cannot see the question . Now you need a quick restorative before you ask. 12 I have no question. I forgot what to decide. 13 This cancels out the terms which you have set and lets the answer show you what the question must have really been. 14 Try to observe this rule without delay despite your opposition. For you have already gotten angry, and your fear of being answered in a different way from what your version of the question asks will gain momentum until you believe the day you want is one in which you get your answer to your question. And you will not get it, for it would destroy the day by robbing you of what you really want. This can be very hard to realize when once you have decided by yourself the rules which promise you a happy day. Yet this decision still can be undone by simple methods which you can accept. 16 At least I can decide I do not like what I feel now. 17 This much is obvious and paves the way for the next easy step. 19 And so I hope I have been wrong. 20 This works against the sense of opposition and reminds you that help is not being thrust upon you but is something that you want and that you need, because you do not like the way you feel. This tiny opening will be enough to let you go ahead with just a few more steps you need to let yourself be helped. 21 Now you have reached the turning point, because it has occurred to you that you will gain if what you have decided is not so. Until this point is reached, you will believe your happiness depends on being right . But this much reason have you now attained—you would be better off if you were wrong . 23 I want another way to look at this. 24 Now you have changed your mind about the day and have remembered what you really want. Its purpose has no longer been obscured by the insane belief you want it for the goal of being right when you are wrong. Thus is the readiness for asking brought to your awareness, for you cannot be in conflict when you ask for what you want and see that it is this for which you ask. 26 Perhaps there is another way to look at this. What can I lose by asking? 27 Thus you now can ask a question that makes sense, and so the answer will make sense as well. Nor will you fight against it, for you see that it is you who will be helped by it. 28 It must be clear that it is easier to have a happy day if you prevent unhappiness from entering at all. But this takes practice in the rules which will protect you from the ravages of fear. When this has been achieved, the sorry dream of judgment has forever been undone. But meanwhile, you have need for practicing the rules for its undoing. Let us, then, consider once again the very first of the decisions which are offered here. 29 We said you can begin a happy day with the determination not to make decisions by yourself. This seems to be a real decision in itself. And yet, you cannot make decisions by yourself. The only question really is with what you choose to make them. That is really all. The first rule, then, is not coercion but a simple statement of a simple fact. You will not make decisions by yourself whatever you decide. For they are made with idols or with God. And you ask help of Christ or anti-Christ, and which you choose will join with you and tell you what to do. 30 Your day is not at random. It is set by what you choose to live it with and how the friend whose counsel you have sought perceives your happiness. You always ask advice before you can decide on anything. Let this be understood, and you can see there cannot be coercion here nor grounds for opposition that you may be free. There is no freedom from what must occur. And if you think there is, you must be wrong. 31 The second rule as well is but a fact. For you and your advisor must agree on what you want before it can occur. It is but this agreement which permits all things to happen. Nothing can be caused without some form of union, be it with a dream of judgment or the Voice for God. Decisions cause results because they are not made in isolation. They are made by you and your advisor for yourself and for the world as well. The day you want you offer to the world, for it will be what you have asked for and will reinforce the rule of your advisor in the world. Whose kingdom is the world for you today? What kind of day will you decide to have? 32 It needs but two who would have happiness this day to promise it to all the world. It needs but two to understand that they cannot decide alone to guarantee the joy they asked for will be wholly shared. For they have understood the basic law that makes decision powerful and gives it all effects that it will ever have. It needs but two. These two are joined before there can be a decision. Let this be the one reminder that you keep in mind, and you will have the day you want and give it to the world by having it yourself. Your judgment has been lifted from the world by your decision for a happy day. And as you have received, so must you give. 1 Father, there is a vision which beholds all things as sinless, so that fear has gone and where it was is love invited in. And love will come wherever it is asked. This vision is Your gift. The eyes of Christ look on a world forgiven. In His sight are all its sins forgiven, for He sees no sin in anything He looks upon. Now let His true perception come to me that I may waken from the dream of guilt and look within upon my sinlessness which You have kept completely undefiled upon the altar to Your holy Son, the Self with which I would identify. 2 Let us today behold each other in the sight of Christ. How beautiful we are! How holy and how loving! Brother, come and join with me today. We save the world when we are joined. For in our vision it becomes as holy as the light in us. When we ask for a new perception to come to us, it means that we are motivated and willing to let our way of seeing be transformed. Jesus assures us, "And love will come wherever it is asked." (W.313.1.2) It is important to get clear about what we really want. Our spiritual aspiration will guide our day. Recently, I was at a workshop where we spent time reflecting on this question. What came to me as my spiritual aspiration was to be aligned with God in every moment. Whenever I was not in peace, I could quickly bring my mind back to my aspiration and remember what I really want. When we say that we want peace, or that we want to know God now, there is a part of us working against this desire. In other words, there is still a part of us that does not want this. If we said it and meant it, we would experience what we say we want. The fact is, we also want to be right, to hold our perspectives, to judge, attack, and defend our position. Jesus reminds us, "To say these words is nothing. But to mean these words is everything. If you could but mean them for just an instant, there would be no further sorrow possible for you in any form; in any place or time." (W.185.1.1) When we ask with deep sincerity, we receive because we already have what we are asking for; and we ask for everyone because there is only one Self. This new or true perception is one "which beholds all things as sinless, so that fear has gone, and where it was is love invited in." (W.313.1.1) Fear blocks love, and grievances are the glue that holds the blocks in our minds in place. Vision has already been given us as a gift from God and not something we need to seek for outside of ourselves. Vision reflects innocence, love, freedom, peace, beauty, and holiness held within our right minds. With a willingness to bring every misperception to the light of truth, we reclaim these gifts. We can't give ourselves this new perception. We just "let" it come to us. Our part is to make space for it in our minds by clearing the inner altar. This is what forgiveness does. We participate in it by being willing to be wrong about the way we perceive everything. We release our judgments to the Holy Spirit, bringing the darkness to the light so we can "behold each other in the sight of Christ." (W.313.2.1) We can't make this happen, but we must let it happen. We must participate in this process. No one can do it for us. In the book, The Eyes of an Angel , the author, Paul Elder, had a spontaneous out-of-body experience where he felt great fear. Then he became fascinated with this experience and wanted to replicate it, but try as he might, he could not. Later, he went to the Munroe Institute to receive help in order to replicate his previous experience. Yet the more he tried, the more he failed. What I see in this is that we can't put the ego in charge of this process. Experience will come when the altar is cleared. Our part is to be open and as willing as possible to hold onto our spiritual aspiration to stay aligned with truth. Our part is to look at our judgments, criticisms, fears, guilt, specialness, defensiveness, anger, attacks, self-concepts, roles, and everything that stands in the way of true perception. It may sound like an immense undertaking, but it is not. We may believe it is difficult, but all that this is is a wrong-minded thought of the ego. Nothing is difficult when we know who walks with us. Our part requires discipline in watching our thoughts and staying vigilant for the Kingdom, but we don’t heal ourselves. The Holy Spirit is the Healer. When we are not at peace, it is because the ego is leading the way. It means that we have wandered away from the peace available to us in each moment and have chosen instead to engage with our fearful thoughts and now see a fearful world. Our decision-making minds made the choice for the ego in the first place, so it is up to us to recognize our power to choose how to see each situation. All Jesus asks of us is for our willingness. The light of Christ is shining in everyone without exception. Yet, we do make exceptions. We tend to put certain people on a pedestal of specialness, while others we judge as the evil-doers, the predators, the takers, and the victimizers. Movies can be helpful to see how we side with those we judge as good, those we see as victims and those we judge as perpetrators. As we experience our reactions, they provide us with opportunities for healing. We make space for the miracle by giving over our fearful thoughts to the Holy Spirit. Holding onto them means we want to be right about the way we perceive the situation. When we see that we are never right in how we judge any situation, healing can begin. Where there is sorrow, joy." This happens not by striving, but only with vigilance in watching our thoughts and being willing to give our misperceptions for correction. "And love will come wherever it is asked." (W.313.1.2) We just need to be willing to choose it, be willing to let go of our perceptions, and be willing to recognize how wrong we have been about everything. Then, the door is opened to the holy altar in our minds. When we see others as selfish, greedy, and self-aggrandizing, we are actually condemning ourselves first for the same thing, and then we judge them for their sins because we prefer to distance ourselves from our own sins. We project our own self-condemnation onto others, believing that God will punish them and that we will escape His punishment. We see them as the guilty ones and ourselves as innocent by comparison. 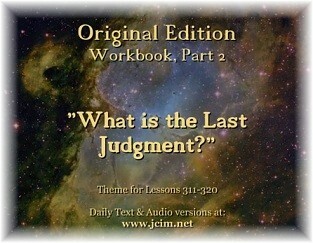 Jesus reminds us in Lesson 311, "I judge all things as I would have them be." We first judge our own faults and shortcomings and then see the world and ourselves as sinful. This perception leaves us feeling depressed. We must be willing to step back and be the investigator of our perceptions and reactions. I find that when I investigate what is going on for me, without crucifying myself for my ego reactions, it can become quite an interesting opportunity to step back and really look at the false beliefs I hold. When we withdraw our interest in what the ego is telling us, it quickly loses steam. When we invest in those thoughts, they can become a storm in our minds. The quicker we are able to notice the thoughts and release them, the less likely they will rage into a full-blown storm in our minds. I heard an interview on the radio last night that really touched me. A man I will call Jack called in to talk about the murder of his father. His father was stabbed many times by someone who broke into his house and stole $60.00. This thief, and murderer, was never convicted because the family interfered with the evidence in the home. This created a great amount of anger among family members, with the exception of Jack. Jack's attention was focused on caring for his father, who did not die immediately of his wounds but lived on for another ninety days. Jack distanced himself from the family members, who continued in their rage about what had happened. One day, Jack was in a grocery line in the store and felt a presence behind him. When he turned around, there was his father's attacker, standing right behind him. They recognized each other and fear showed up in the attacker's face; but then, a miraculous thing happened. According to Jack, he saw the man as totally transparent. Then, he heard a Voice tell him that he was looking at the Christ, created pure and holy and that forgiveness was the only response he was asked to make. In that moment, Jack understood there really was no murderer and that nothing had happened that was real or true. He saw that everyone played their role in the dream as agreed. Jack then reported that thirty days after this encounter, the seeming "murderer" suddenly died. Clearly, Jack's mind was open to a new perception of the murderer, and thus, he was given an opportunity to see who he really was as the Christ. We can't make it come, but we can let it come. It is all about readiness. Jack had been in loving service to his father rather than engaging in the grievances and anger the other family members were experiencing. The idea that everyone plays their role in our lives as agreed upon is interesting to think about. If they agreed to play a difficult and even seemingly punishing part in our script, perhaps they are actually paying off some kind of karmic debt by offering us an opportunity to learn a lesson we have agreed to learn. They are just playing their part and as such, perhaps achieving healing for themselves. Remember, karma is simply a cause and effect phenomena. It is not something brought to us by God, but by our own beliefs. Now Jesus urges us, "Brother, come and join with me today. We save the world when we have joined. For in our vision it becomes as holy as the light in us." (W.313.2.4-5) Today, let no belief in smallness, unworthiness, or any kind of judgment occupy your holy mind. Today, I would see only the beneficent, the innocent, and the loving, for that is the only thing real and true; but I can't do it unless I am willing to release the judgments I make. I can only do it as I resist the temptation to attack. This means I must watch my mind and not get attached to my thoughts. It is about having only one goal, which is to return my mind to truth. It is to practice the power of my mind to choose. When I experience attack of any kind and feel unfairly judged, I find it particularly challenging to maintain a loving perception. That is when I most need to ask for help. Whenever we attack in return, we are trying to achieve our innocence while seeing our brother guilty. Seeking innocence in this way is the ego's answer for our anger. It tells us we are justified in defending ourselves against seemingly unfair attacks on us; but this is not the kind of innocence that mirrors the innocence given us by God. He knows we are innocent, and we can only know it when we release our attack thoughts, even in the face of having been "unfairly" criticized or "unfairly" treated. Later in this Section, he says, "You are not asked to repeat my experiences because the Holy Spirit, Whom we share, makes this unnecessary. To use my experiences constructively, however, you must still follow my example in how to perceive them." (T.6.I.11.2-3) (ACIM OE.T.6.II.14) The message of the crucifixion was, "Teach only love, for that is what you are." (T.6.I.13.2) (ACIM OE.T.6.II.18) We can only know that love is what we are when we extend forgiveness and receive our brother's gratitude, which then teaches us we are indeed the beloved. With each event of this nature, a new perception can come to us until we truly know the unchanging and unchangeable truth about ourselves.